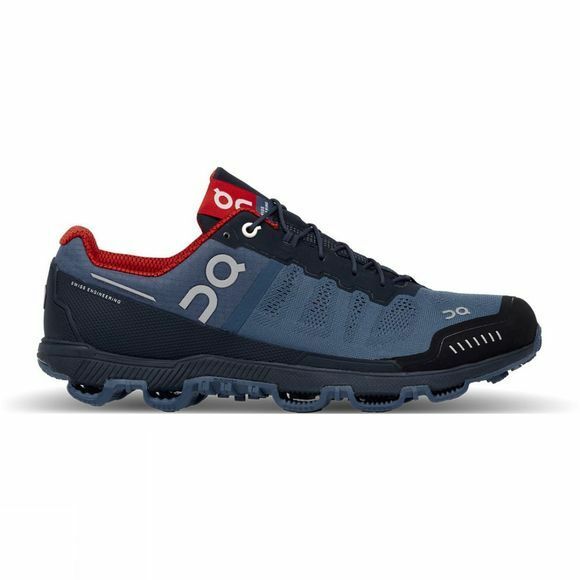 Runners looking for a lightweight trail shoe with full cushioning protection, look no further than the Cloud Venture from On. “Shark-teeth” at the sides of the sole enable grip to be found on trail running terrain even during the most extreme movements. The entire sole features an extruded triangular grip-pattern, made from a newly developed, anti-slip “sticky” rubber. Arrow-shaped elements at the heel and front of the sole enable a secure grip upon impact and the transmission of force at take-off. Crystal-shaped ridges provide directional grip and stability without stopping the natural flow of motion. Tested in the most demanding conditions, On have developed the perfect 2-layer upper. The inside layer allows for comfort and support, while the top layer is breathable and coated in a durable water repellent for when the storm catches you by surprise. When scaling the ridges and descending down to the valleys, On found multiple styles of cushioning were needed. Enter their patented CloudTec® sole. Horizontal and vertical cushioning combine for firm yet soft landing support and an explosive take-off in these trail running shoes.